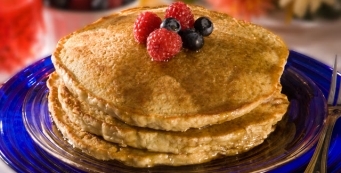 Print Oatmeal Pancakes Ingredients 2 cups all-purpose flour 1 cup Coach’s Oats® 1 tsp. baking soda 2 tsp. baking powder ½ tsp. salt ¼ cup sugar 2 eggs 2 tsp. 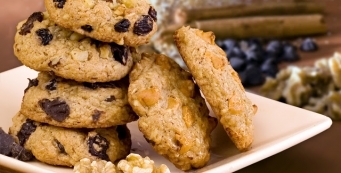 vanilla 1 cup milk 1 cup water Instructions In a mixing bowl, stir together dry ingredients. In another bowl, combine eggs, vanilla, milk and water. 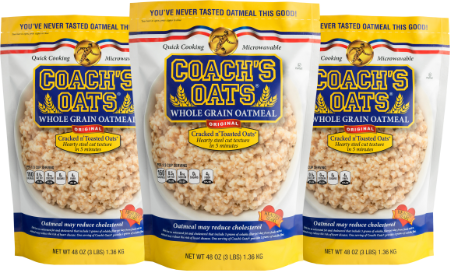 What are people saying about Coach’s Oats? 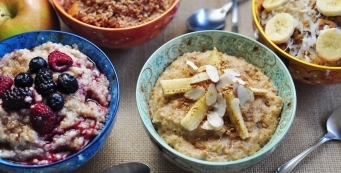 Don’t just take it from us, let our oat lovers do the talking!